God wants us to draw closer to him each day. We each have a light inside of us drawing us to him like the instincts in an animal. As we reach for God our lives will be better and we will be able to bless others around us. Have tape and three feet of string ready for your lesson. Tell the story of Bobbie the Wonder Dog in your own words. “Some monarch butterfly populations migrate 3,000 miles (4,800 km) each year to climes better suited for their survival. “Leatherback turtles travel across the Pacific Ocean from Indonesia to the coasts of California. “Humpback whales swim from the cold waters of the North and South Poles toward the equator and back. Each of us wants to go home. He knows how we feel and wants to help us. Why do you want to go back to your Heavenly Father? Here are Two reasons WHY we should listen to God’s voice and begin our journey home. How will your life be better by following the Gospel plan? Follow up question: Will you still have trials? Following Christ will create a direct line or path to our Heavenly Father and you can use this line to guide you back home to him. How do you hold onto this line? The second reason to follow this path is because we are not the only ones on this path. Others are also on this journey and as you follow God’s path you can help others follow Christ too. How can you help your Brothers and Sister? How can you help your friends and neighbors? In your own words talk about how maybe you, or others, have felt like they can’t be a big help to anyone else. What are some blessing from helping others come closer to Christ? For each blessing listed add an extra person to the string and move all the members up the string. Examples of blessings: We become more like our Savior. We feel more happiness. Our testimony strengthens. We see God’s Hand in our lives. We become more confident. The pain of sin is swallowed up in Christ. Uchtdorf concludes, “No one else is responsible for your personal journey. The Savior will help you and prepare the way before you, but the commitment to follow Him and keep His commandments must come from you. That is your sole burden, your sole privilege. This is your great adventure. Please heed the call of your Savior. Read Sharon Eubank’s Talk “Turn On Your Light” from October 2017 General Women’s Session of General Conference. 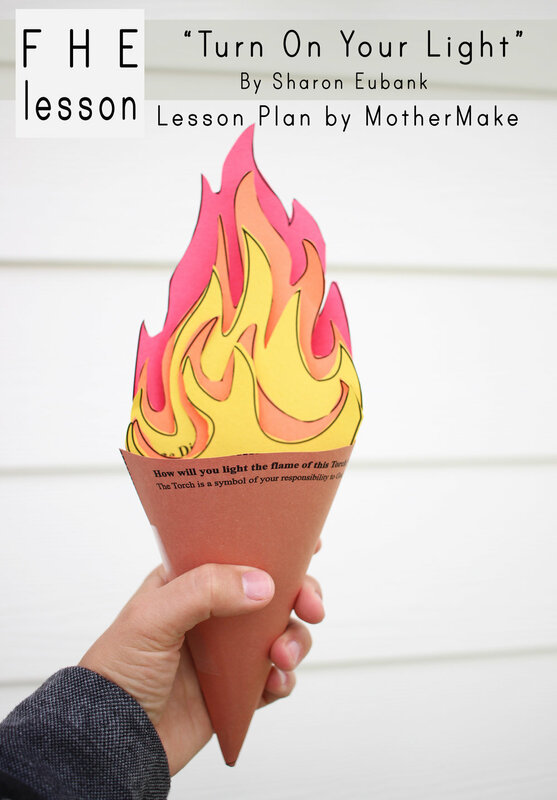 Print the Flame Handouts on different colors of paper or white and color the paper with crayons or marker. Cut torch and tape in cylinder. Cut flames to place in Torch during lesson. How can you be a light to others and help them want to come closer to Christ? God wants to use you in his work. Here are five ways you can be a light to others. The prophets have given us a torch and ask us to be a light. How will you light the flame of this Torch? The Torch is a symbol of your responsibility to God. ASK: What does it mean to be Righteous? You aren’t perfect, but keep learning how to repent and to keep trying. How can you help others who are trying to be better? ASK: What does it mean to be Articulate? How do you feel about the Christ? Where can you express how you feel? ASK: What does it mean to be Different? Tell the Story of the human chain to struggling swimmers. ASK: What does it mean to be Distinct? In what ways are you distinct? (What talents and gifts make you different? What talents can you develop? Go around the room and have every person identify one of their talents. 5 Live in happy ways. ASK: What does it mean to be Happy? What small ways can you be happy? “Behold, I say unto you, go forth as I have commanded you; repent of all your sins; ask and ye shall receive; knock and it shall be opened unto you. “Behold, I will go before you and be your rearward; and I will be in your midst, and you shall not be confounded. Activity: Have everyone in the room make a large human chain like in the story from the talk. Then pass the torch from one person to the next. Download and print a free copy of the torch and flames here.